Most of the following has been lifted directly from the awesome D*iaspora project. A lot of new contributors that want to dive in to helping fix bugs and develop new awesome things often ask “Well, where do I start?”. Below are some links to comprehensive resources so that newcomers can get up to speed and get dive right in to fixing bugs. 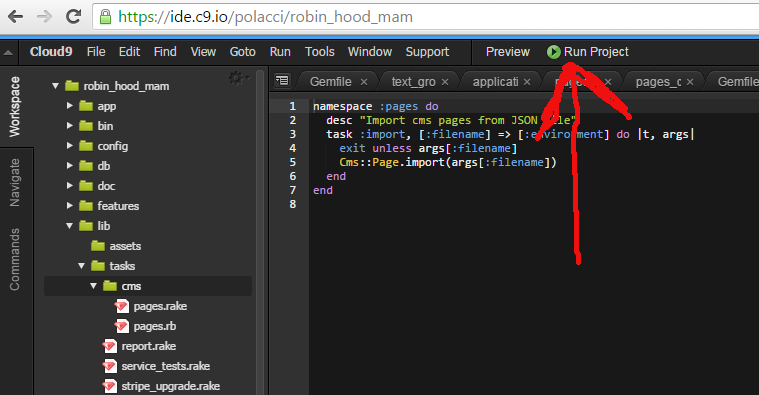 All of Robin Hood’s code is hosted on Github, a social coding platform that leverages Git for many different Free and Open Source projects. You can use any operating system to contribute with GitHub, all you need is an account and to follow GitHub’s easy and helpful guide for setting up your account from the command line and learning to use the commands. Git is supported on all major platforms. Once you’re all set up, check out the issue tracker and watch for entries tagged with “newcomer” or “quickfix”. Most often those are the things which you don’t need a deep understanding of the complete codebase for to work on them, and the tasks should be easy enough for novice programmers to tackle. <color=red>!! THIS IS WORK IN PROGRESS !! Certainly not yet a working solution. Cloud 9 free plan offers one private workspace. So, you can use cloud9 for this completely free. RHC source is not (yet) public so you should use the private workspace. 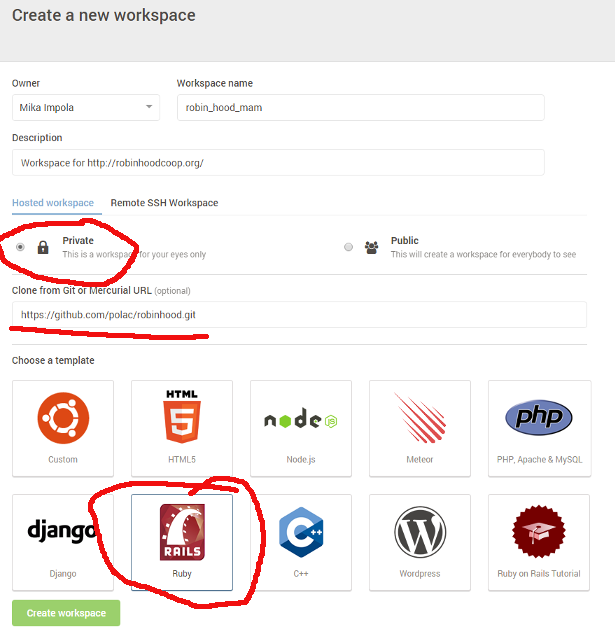 Create account in c9 and then select to create new workspace. There is basically 3 thing that you should make sure to get right when creating new workspace: Check that the workspace you are creating is private ( <- at the moment this is very important!! ), clone from your newly created fork and last select ruby on rails template. If you created your cloud9 account using github credentials you most likely should now have successfully cloned the RHC repo. Congratulations, you can skip rest of this topic. If you didn’t use your github credentials you most likely see some kind of cloning error in terminal window or it is asking password for ubuntu-user for github login. If later case just end the login pressing CTRL-c keys. Problem is that github doesn’t have the ssh-keys of your ssh-client. Select the text that was printed on the terminal and copy it to clipboard by pressing CTRL-c. Now you can follow the instruction found from this page. Start from the step 4. When it asks for a password just enter password. Before installing all dependencies we need to install nokogiri separately. Otherwise the cloud9 runs out of memory. After that we can install all other dependencies, setup the database and load some initial data. Just click run project from the “Run Project”-button. 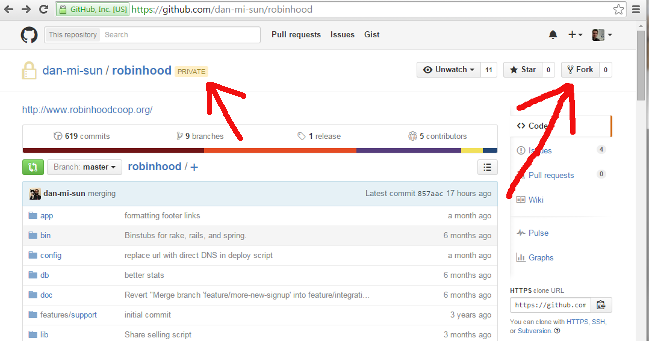 https://github.com/dan-mi-sun/robinhood returns 404. Where does the code live nowadays? Hey! What is your github username? It’s “tanuk”. From your question I’m guessing that the project is hidden from public. If so, what’s the reason for that? I think limiting the visibility is bad for getting new contributors. As for the call for new team members, I’m not a web developer (and I won’t be able to donate much time anyway), so I’m very hesitant to present myself as a new team member candidate. However, I am interested in browsing the bug list in case there’s something that I could help with, and I might want to report new bugs too.